(9 April 2019) Two Keynote sessions (Keynote (4) and Keynote (6)) are swapped. (9 April 2019) PhD Symposium Session (1) is moved to 10 April 2019 14:35-16:05. 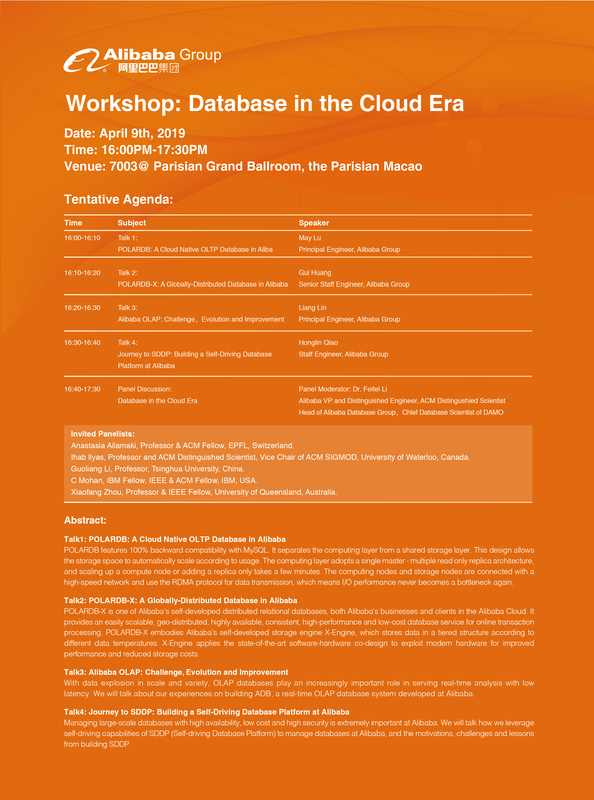 (8 April 2019) Forum: Database in the Cloud Era is now added into the program. (2 April 2019) ICDE 2019 Influential Paper Award announced! (1 April 2019) ICDE 2019 webpub is online. (1 April 2019) IEEE Computer Society Open Conference Statement and IEEE Event Conduct and Safety Statement have been updated. (19 March 2019) The pre-conference registration is on April 7th 12:00-20:00 at Foyer, Parisian Grand Ballroom, Level 5, The Parisian Macao. (6 March 2019) FAQ for Sponsors and Exhibitors is updated. (2 February 2019) Keynote talks have been updated. (29 January 2019) Visa & Invitation Letter information has been updated.